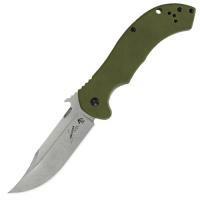 The Kershaw 6030 Emerson CQC-10K is based on the popular Emerson Appalachian knife. It is a versatile Bowie-style folder, originally designed for hunting but capable of tackling many outdoor and utility tasks. The premium steel blade holds a sharp edge and can be resharpened easily to make field maintenance quick. It features the Emerson "wave shaped opening feature" that allows it to be opened as it is drawn from the pocket, as well as a thumb disk for manual deployment. The handle comes with an index finger indentation and a large thumb ramp for a secure and controllable grip, and its G-10 front scale is textured to keep it from sliding in the hand. The steel rear scale comes with a reversible pocket clip for ambidextrous portability.